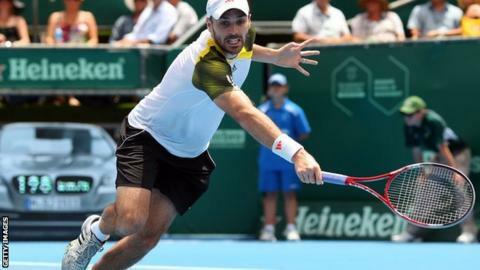 Britain's Colin Fleming claimed his second ATP doubles title of the year as he teamed up with Rohan Bopanna of India to win the Open 13 in Marseille. The pair beat Pakistan's Aisam-Ul-Haq Qureshi and Dutchman Jean-Julien Rojer, the top seeds, 6-4 7-6 (7-3). The Scot, 28, has now won seven ATP doubles titles, three with Hutchins. "It's a great day for us," said Fleming. "We beat one of the best teams in the world. They played the Barclays ATP World Tour Finals last year and I'm sure they'll end up there again this year." Bopanna added: "It's always tough to play against friends. Then, I also want to thank my partner. He wasn't feeling well this morning but he came out and played a great match." Fleming began the year playing alongside Jamie Murray in Brisbane and then before a disappointing first-round exit with Murray at the Australian Open. A burgeoning partnership with Wimbledon doubles champion Jonny Marray was then interrupted when the Englishman suffered a calf injury in Rotterdam earlier this month. The singles title in Marseille went to Frenchman Jo-Wilfried Tsonga, who beat Czech top seed Tomas Berdych 3-6 7-6 (8-6) 6-4.